Looking for tips to pass NDA & NA exam I 2013? NDA exam is scheduled to be held on 14th April 2013 in various centers in India. 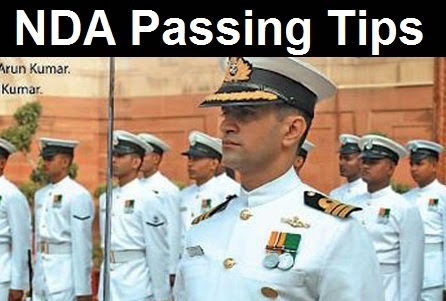 Read on to know best tips to score high marks in NDA & NA examination I 2013 and to secure place for SSB interviews. NDA & NA examination I 2013 notification was released by UPSC on 22nd December 2012. Now last date to submit online applications is also over. Admit cards of NDA & NA exam are also placed in UPSC's official website which can be downloaded by the candidates. UPSC will conduct NDA & NA I 2013 examination on 14th April 2013 in its centers. This examination is considered as one of the toughest exam to crack. There is negative marking for every wrong answer given by a candidate which makes passing NDA & NA exam more difficult. Here we have provided best NDA exam passing tips for our readers so that they can excel in the exam. Prepare yourself with best NDA & NA exam books. Without preparation, one cannot pass this exam. If you have considered NDA exam not seriously, still one week left for it. So please go through books and prepare your self. Current affairs is one of the best areas in NDA & NA examination for scoring as they will be easy to answer if you have gone through once. In order to prepare for current affairs, candidates can go through our online current affairs tests as well as refer competitive exam books. Also going through previous year question papers of NDA & NA exam will help you to crack the exam easily. After you receive answer sheet and question paper of NDA & NA exam I 2013, go through it quickly. After going through the exam paper, first attempt all questions which are very easy and you are sure about the answers. After finishing answering all questions you are sure about, attempt the questions that you have 70 - 80% confidence. Now calculate number of questions you have answered. Give 3 marks to questions which you have attempted in first time and 2 marks for all those questions which you have answered in second time. Total the marks and if the total marks is well above 60% of the maximum marks, try to attempt other tough questions. If you got 55-60% marks in the above calculation, we suggest you not to answer further. If you got less than 40% marks, we suggest you to attempt questions which you think of 50-50% chances. After writing answers for all possible questions of NDA & NA examination I 2013 question paper, re verify the answers once again to make sure you have not circled wrong answer by mistake. Don't divulge yourself in cheating or helping other students as the administration is very strict on this issue. So all the best dear NDA aspirants. After giving NDA & NA I 2013 exam question paper, please do prepare for SSB interviews without wasting time.